Earlier this year I spotted this pretty little 1964 Rambler station wagon at the Rock River Rodders car show in Colona, Illinois earlier this year and it reminded me, as these entries so often do, of a car show DVD from FinsAndFenders.com. "Doheny Wood!" features a full range of really cool woody station wagons gathered on a (dry) beach in Southern California. These guys spend so much time, effort, and moolah on the wood bodies of these beautiful cars, that the thought of rain sends them packing. From the very very rare 1946 Mercury Sportsman woodie convertible (the only remaining factory-built model in exhistence!) to a striking 1949 Chrysler Town and Country convertible, we're talking wall-to-wall wood paneling on wheels. Interviewees talk bird's eye maple, hydro-electric windows, veneer, surf boards, and Jan and Dean. Classic car trivia and restoration stories and tips put a final coat of vanish on this DVD. "Doheny Wood!" makes a great gift for the wagon-loving classic car buff (or is it the wagon-buffing classic car lover?) in your life. Station wagons are the next big thing in classic cars, so order your DVD today! 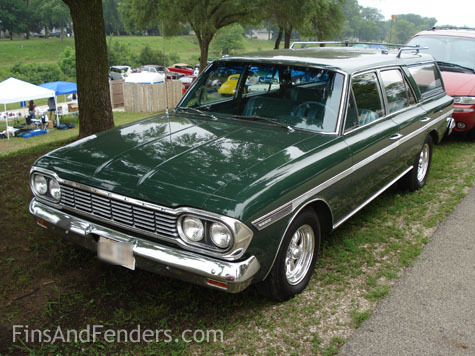 And yes, there are more Rambler station wagon pics in the gallery.